Without fertilizer your Florida lawn will have a difficult time reaching its full potential. A healthy lawn is green, however, you must know how to properly utilize nutrients. Florida lawns have unique needs when it comes to fertilization, and you also want to take the health and wellbeing of the environment into consideration when you fertilize. Here are some tips for getting that lovely green Florida lawn you desire, while also being kind to the environment. Unlike most other parts of the country, Florida lawns grow pretty much year-round. There may be some times when the grass seems dormant, such as if there is exceptionally cold and dry weather in the winter; in Florida, you never know what kind of winter you are going to get, but it happens. Generally, the farther south you go in Florida, the more likely it is that your lawn will grow year-round. If you have a period when your lawn is not growing and you fertilize it, you could damage the grass (or even kill it, which would mean re-sodding, which is expensive). 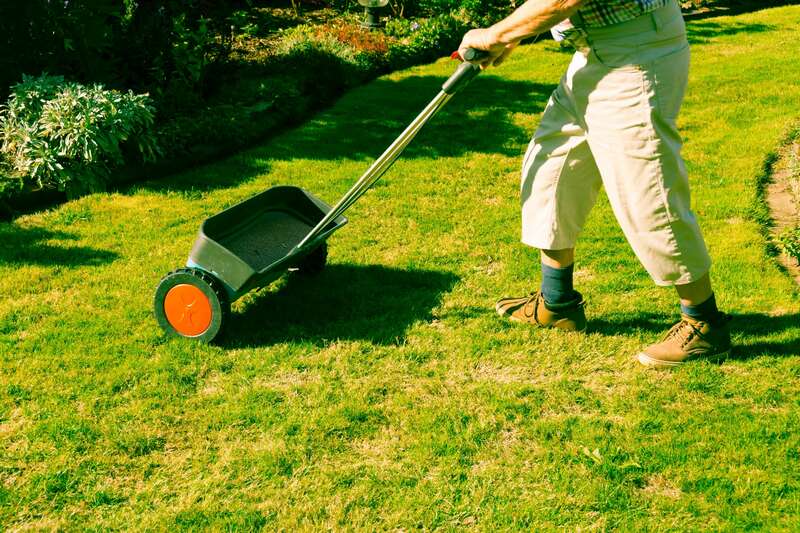 Slow-release nitrogen fertilizer is best for Florida lawns because it releases the needed nitrogen to the grass over a long period of time, which means less fertilizing you have to do. Just make sure the fertilizer you choose has 2% or less phosphorus content, to be in compliance with Florida law. Using too much fertilizer can damage your lawn. So, how do you know how much is enough to use? First, learn the square footage of your lawn. Then, determine the type of grass you have in your yard. Once you have this information, contact your county Extension office, or Duda Sod, and provide the relevant details. An expert will tell you how much fertilizer to use based on the square footage and type of grass on your lawn. If they cannot determine it from the above information, someone will come out to take a soil sample of your yard that will yield more accurate information on the amount and type of fertilizer you should be using. If you do have a soil sample taken (and, it’s a good idea if you’ve never done it before), you will find out the phosphorus level of your yard. It is common for Florida lawns to have normal or even high phosphorus levels. If this is true for your yard, always use a fertilizer that has a low phosphorus content, so as not to damage the soil with additional phosphorous it does not need. This is important for environmentally friendly fertilizing. The ideal pH level for most grasses is between 6.5 and 7.0, which is considered neutral. However, it is not uncommon for Florida lawns to be a bit on the acidic side. If this is true of your yard, putting a lime application on the lawn before fertilizing is a great idea. It will take down the acid level of your lawn, and make it safe to apply fertilizer afterward. The fertilizer will also work better when your lawn is less acidic, so this is a good tip if you want a really green lawn. If you fertilize just before a rainstorm, you are just wasting your time. It takes some time for fertilizer to reach the roots of the grass, where it can be absorbed and put to good use. Applying fertilizer before it rains means the fertilizer gets washed away, and your grass gets none of the good nutrients you just put on it. Instead, the fertilizer is washed into the area’s waterways, where it will pollute them. In addition, you will just have to fertilize again after the rain, which is not cost effective for you, and bad for the environment, as well. Essentially, if you know rain is coming, don’t bother fertilizing until it’s done. If you follow these tips, you will be responsibly fertilizing your Florida lawn, while protecting the environment at the same time. This is a win-win situation for everyone, including your yard. For more detailed instructions on properly fertilizing your unique Florida lawn, please refer to the IFAS/ The University of Florida guidelines. These articles will help you determine the exact levels of which nutrient your lawn needs no matter which region of Florida your lawn calls home.